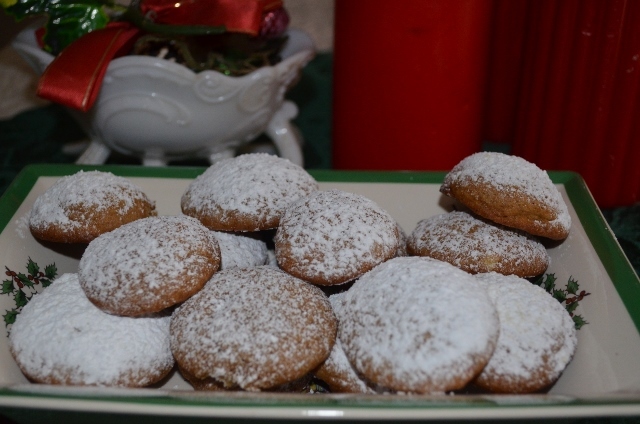 This is a traditional German spice cookie that my mother-in-law always made at Christmas. 2. Beat butter and sugar in a large blow with electric mixer at medium speed until light and fluffy. Beat in molasses and egg. 3. Gradually add flour mixture. Beat at low speed until dough forms. 4. Shape dough into a disk; wrap in plastic wrap an refrigerate until firm, 30 minutes or up to three days. 6. Roll dough into 1 inch balls. Please 2 inches apart on greased cookie sheets. 7. Bake 10-12 minutes or until golden brown. Transfer cookies to write racks; dust with sifted powdered sugar. Cool completely. 8. Store tightly covered at room temperature or freeze up to 3 months.